Common but local across southern England and south Wales as far north as the wash with scattered records north to Scotland. Prefers open, dry habitats with short grass e.g. parkland and agricultural fields but also occasionally in woodland. 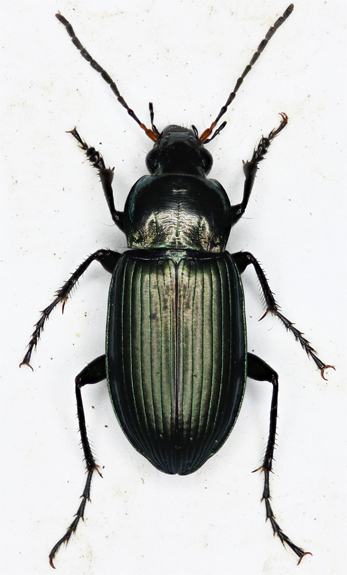 Easiest to find nocturnally when they are active on parkland pathways throughout Watford although they are usually found singly and demand a good deal of work, the vast majority of specimens examined will be Harpalus affinis (Schrank) which this superficially resembles under torchlight, both species freeze when illuminated. 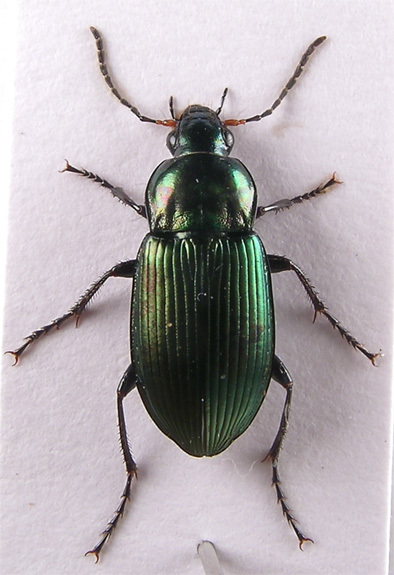 Occasionally found active during hot dry summer days running on pathways etc., sometimes in town centre pitfall traps and often under logs around dry woodland borders. Breeds in the spring. 11-13.5mm. 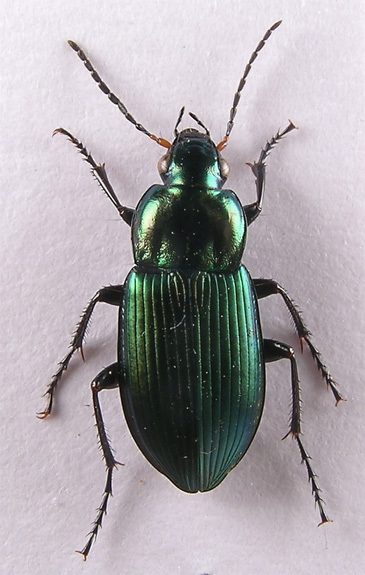 Head, pronotum and elytra dull metallic green, rarely black. Head finely punctate, easiest to see behind the level of the eyes, 2 setae or pores inside eyes. Antennae black with 2 basal segments light brown, segments 1-3 glabrous and keeled above. Palpi black, yellow at tip. Pronotum with 2 broad fovea, broadly explanate behind middle, not wider than elytra over shoulders. Eltra with 2 pores behind middle on third interstice or adjoining second stria, epipleurs crossed Legs black, femora sometimes rufous (cf. H.affinis), tibial spurs and claws dark red.